This is every girl's dream for a bedroom! Whenever we have kids in the house, we see to it that we give them everything they need to make them feel comfortable and loved, as well. One way of showing our love to them is to give them a lovely bedroom- yes, this is what every little kid wants to have. If you have a girl, for sure, you would fill their bedroom with pink colors or other feminine colors and decors. Some would even add more perks in the bedroom like a tent, a slide, a tea table set, a mini library, a theater and others. It actually depends on the what your child wants and what they need in their bedrooms. Aside from the bed itself, make sure that you will also bring in other items that will make your child feel that they have their own special place in the house- not just a sleeping area! 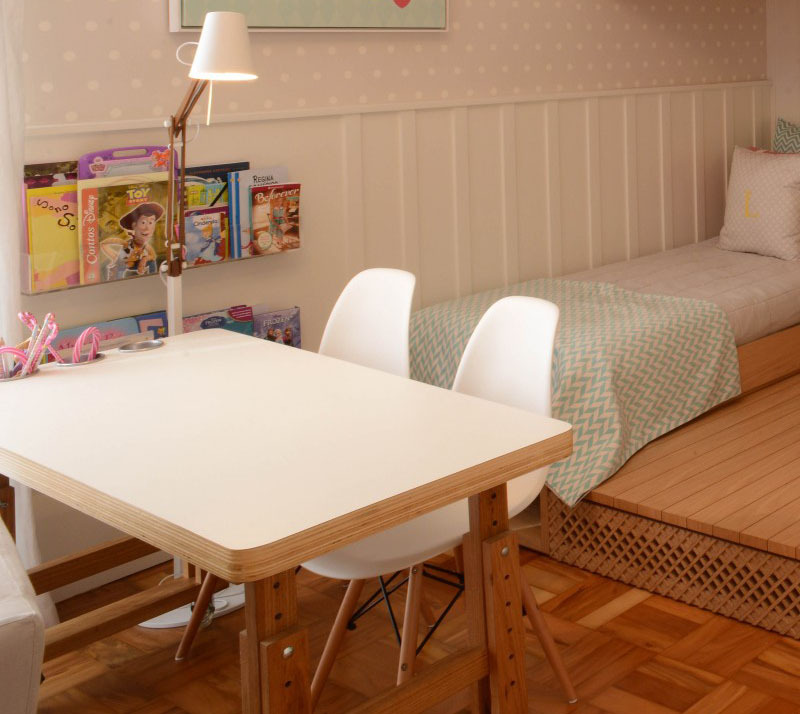 So today, we are going to feature a cute girls bedroom that features a lofted playspace. 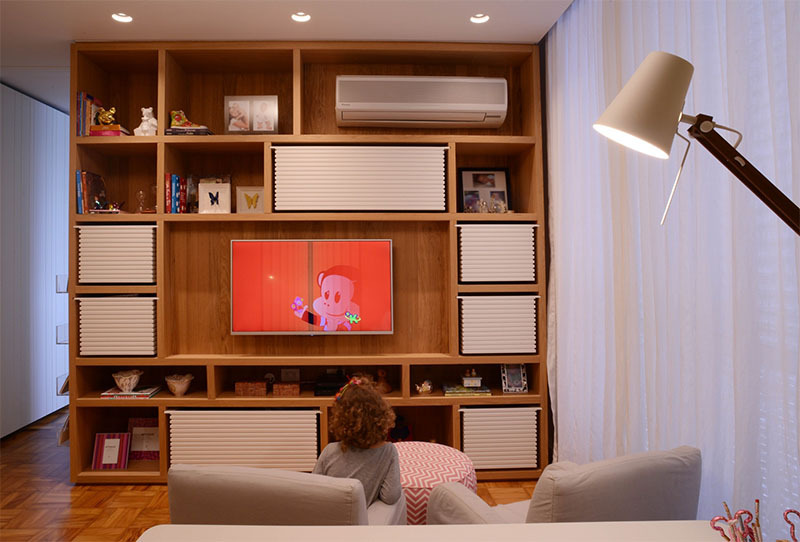 The bedroom is designed by Cadas Arquitetura in an apartment for a family in Sao Paulo, Brazil. 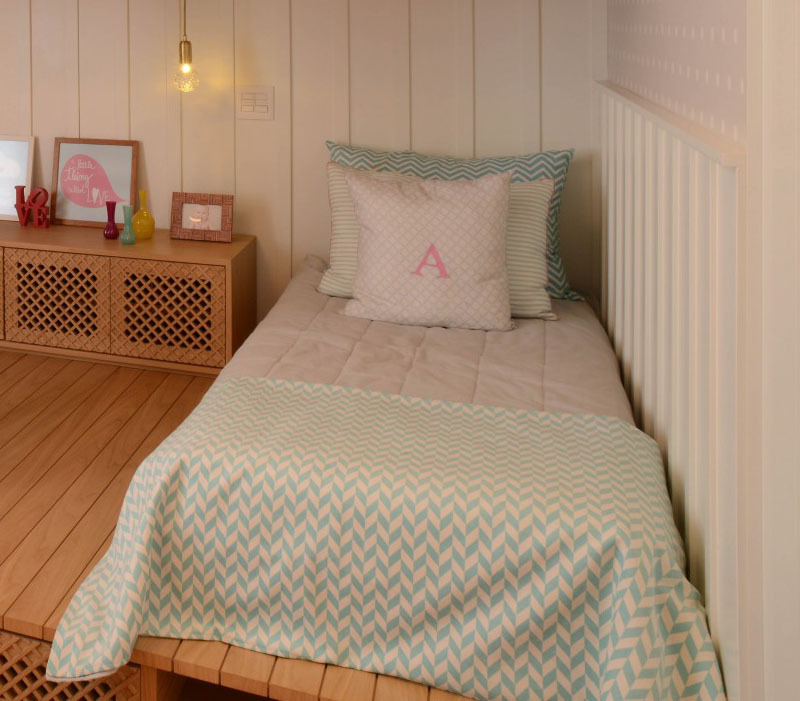 The family decided to make their girls a bedroom that is not just for resting and sleeping but would also be their fun play area. 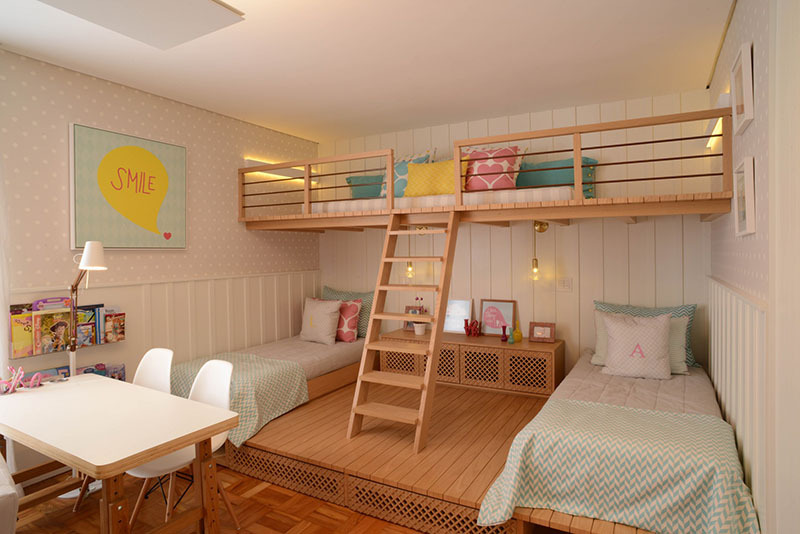 Hence, their bedroom featured a playspace in a loft above the beds. Aside from that, the colors and the design of the space is very nice as well. Let us take a look at the bedroom through the images below. 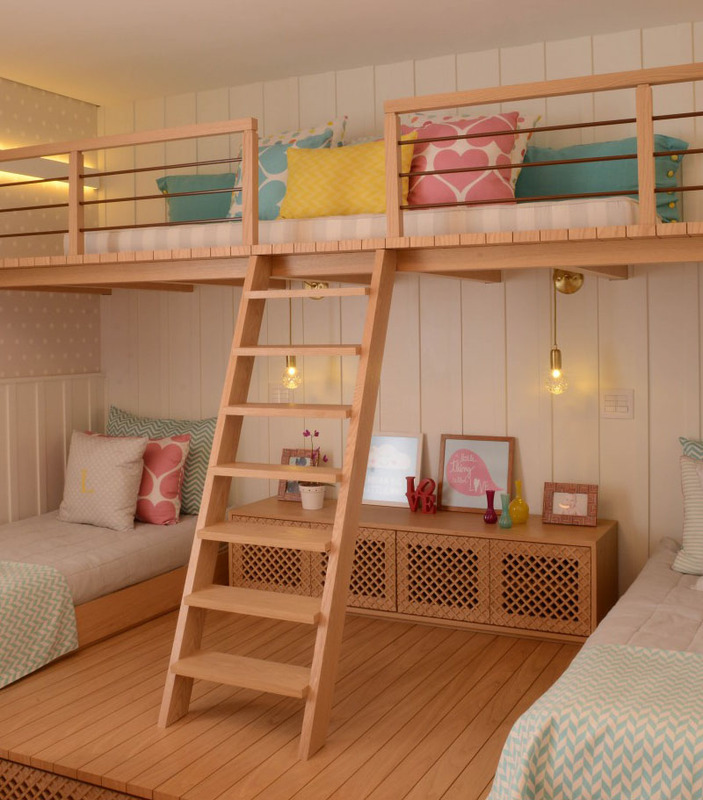 Unique feature: A beautiful bedroom for girls featuring a lofted playspace making the area a place for both fun and rest. 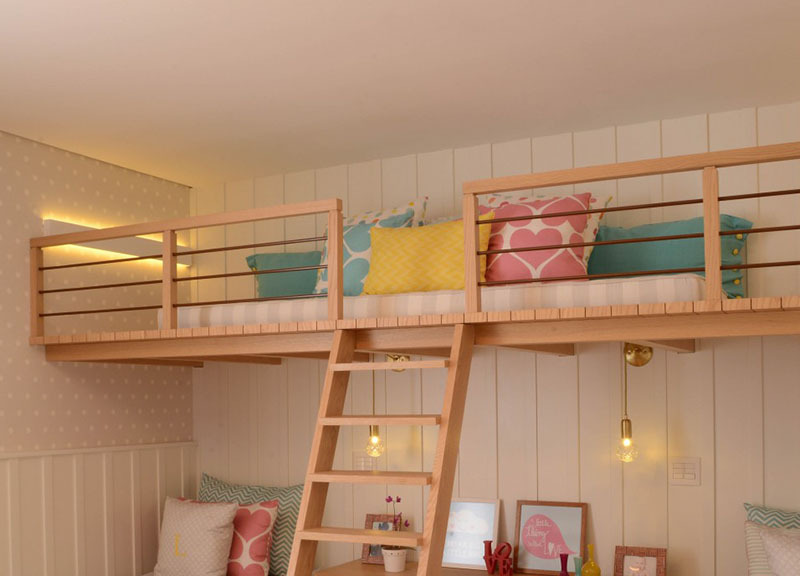 This is the lovely contemporary bedroom intended for little girls. You can see that it has colors that will tickle your heart and will make you fall in love with the space. You can also see here that it has storage space on the floor too. I also like the wallpaper it used to combined with the white painted wooden wall. The bedroom combined various sweet patterns in it from the wall to the pillows. Even that wall decor looks really nice as well. But what added to the area’s appeal is the wooden material it used here. The bedroom has two matching beds and the girls share a cabinet that is positioned between the beds. The cabinets also double as a side table. Each bed has a small pendant light as a bedside lamp. 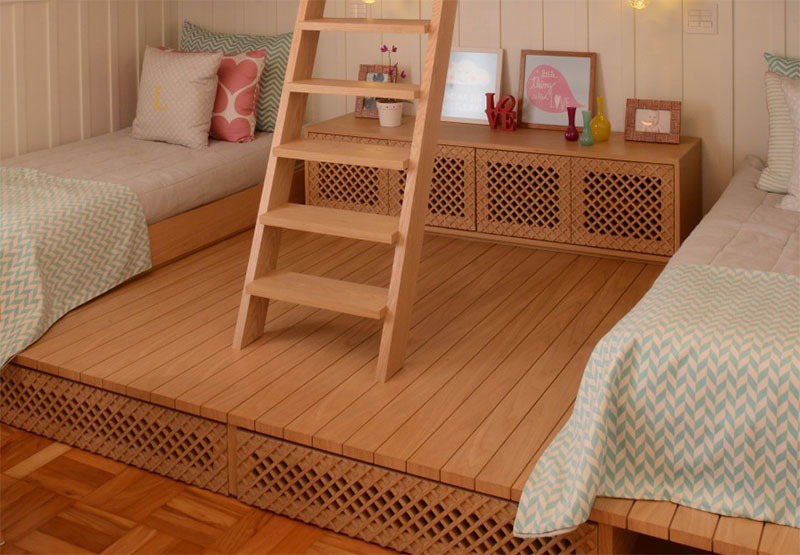 The beds are raised up on a wooden platform which provides extra storage. Notice that the storage design matches with the cabinet. It looks really nice, right? On the platform, there’s a ladder that leads up to the lofted playspace. I would guess that it is totally fun to climb this ladder everytime they decide to play. Aside from being a playspace, this area could also double as an extra space for when friends sleep over. Isn’t it a nice idea? And it also doubles the function of the area. Back on the main level of the bedroom is a desk at the end of the beds where the girls could do their homework, write or do some artworks. They can even do a pretend tea party here. Beyond the desk, and opposite the beds and playspace, is this entertainment area which features a storage wall that also holds the television. The storage wall has white textured drawers that slide out. It would definitely be nice to have a bedroom like this one especially that it has its own entertainment area with comfy seats. Isn’t this a lovely bedroom? It sure is! It is also a sweet gesture of love from the parents who gave the girls this bedroom. Well, we all know that not all little girls are blessed with bedrooms like this. Hence, the girls who owns this bedroom are one of blessed ones around the globe! This bedroom is designed by Cadas Arquitetura who made sure that it will have a look that will perfectly suit the taste of the girls. 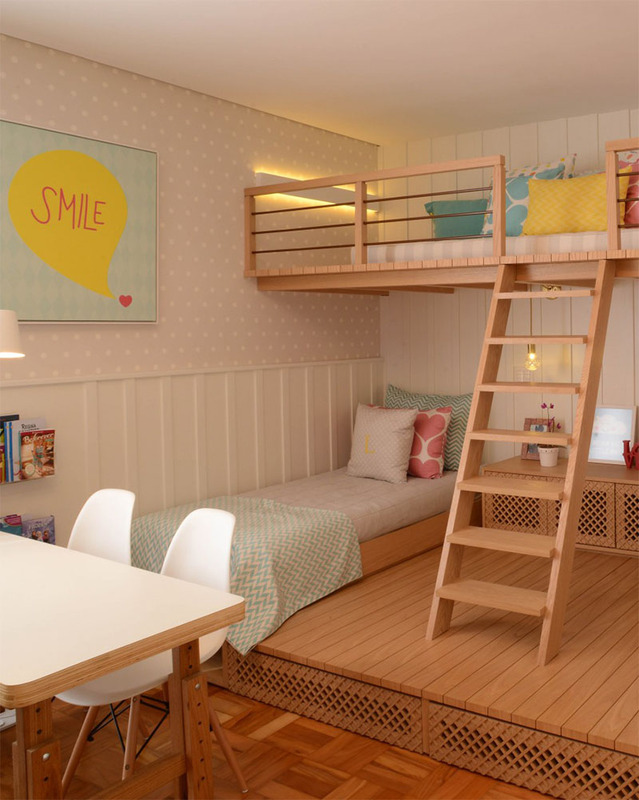 Apart from the lofted space, it also has many storage areas that are creatively located to save space. How about you, can you tell me what certain features of this bedroom do you like the most?